Unless you’re in a dramatic location – the scene of a fire, earthquake or riot etc – a down-the-line TV interview, where you, the interviewee, looks directly into the camera and hears questions through an earpiece, is rarely as attractive as being in the studio, where the interviewer can see the “whites of your eyes” – and you can see theirs. But when a TV channel is offered a world-exclusive interview with the Duchess of Sussex’s father, no wonder it said “yes” to the interview, despite the constraining format. 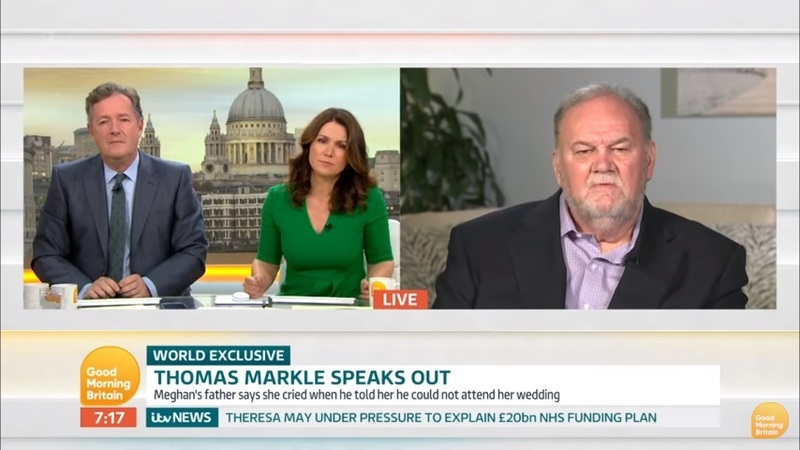 And so on Monday viewers of Good Morning Britain watched Piers Morgan and Susanna Reid in London interview Thomas Markle in, presumably, a hotel or his home in Mexico. Judging by the articles and social media comment that followed, the overwhelming “verdict” was that it seemed awkward, even “excruciating” at times. Mr Markle, who had heart surgery just weeks ago, appeared ill-at-ease and uncomfortable. I suspect the interview format had much to do with this. A down-the-line interview is like no other type and anyone about to undertake one should understand its unique demands, if they want to appear comfortable and in control. I saw no sign Mr Markle had received any advice on how to achieve this. Look down the “barrel of the camera”. This is the only time you do this (usually you should look at the reporter, not the camera). Thomas, your eyes were all over the place, gazing at the floor, or to the side. Sometimes you glanced heavenwards, which makes an interviewee appear to be looking for divine inspiration. Don’t look at the monitor. We can’t be sure there was one, but a few times it looked as though you were checking the shot. Turn it off, it’s a distraction. Don’t fiddle with the earpiece. You did this quite a bit, Mr Markle, possibly because there seemed to be a delay on the line. It makes you look awkward and it distracts the audience – we focus on your problem with equipment, rather than what you’re saying. A few times it seemed you’d finished your answer and there was a pause. But because Piers or Susanna didn’t chip in with another question, you carried on with some more juicy comments on the Royals. Don’t fill the silence. Say what you want to say and STOP! Don’t be led. I suspect you didn’t think about what you wanted to get across, no matter what you might have been asked. Instead, it seemed you were there to simply answer whatever questions were thrown at you.Very helpful. But as a result, we learnt all sorts of things about the Royals, Brexit and politics that you (and they!) might well regret and these have kept the story running and caused a good deal of flak for you. Beware of nodding while you’re being asked a question – it’s a natural reaction, as if to convey, “I hear what you’re saying”, but if the question is accusatory and damaging, then unwittingly you appear to be agreeing with it. If Mr Markle wanted this interview to “calm the waters” after his wedding no-show, perhaps, with hindsight, he might have wished he’d taken Harry’s apparent advice not to talk to the Press, as it only encourages them. Now that he has encouraged them, we hope Mr M. has some media training to cope with all the different sorts of interview that could come his way. But perhaps, in the interests of journalistic balance, it’s only fair to point out that not just novice interviewees slip up – even seasoned interviewers don’t always get it right. My favourite part of this exclusive chat came from Piers Morgan, not Mr Markle. Did anyone else spot Piers say at one point that something “flied in the face really of what Harry had been hoping to achieve”?! It’s good to realise no-one’s prefect, sorry, perfect.